One reason you may choose to take public transportation is to reduce your carbon footprint. And while one less car chugging away on the highway is great, by taking a bus or train you’re also supporting major sustainability initiatives that help improve our environment. One such initiative is Metro’s permeable pavement project, piloted at Metro’s Bus Division 4 in Downey. This site was chosen because it is located in an area that Caltrans identified as having stormwater that is challenging to treat. Permeable pavement is a way to turn our parking lots into tools that can capture, clean and store stormwater. 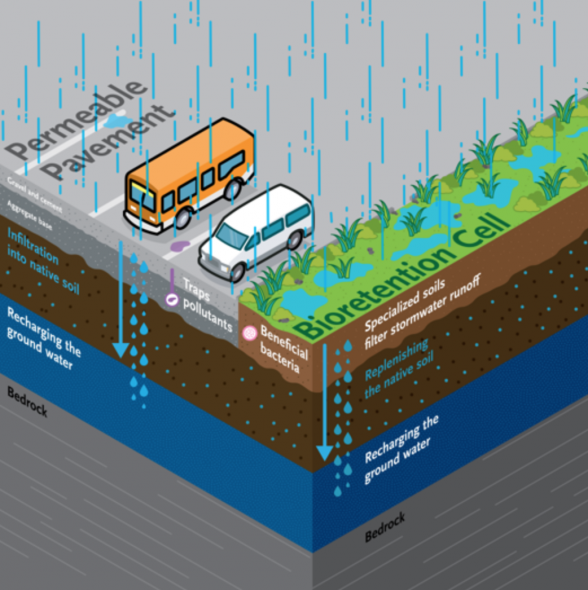 By using permeable pavement, parking and operations can go ahead as usual, but water can seep through the pavement into native soil and recharge groundwater supplies — instead of running into a drain and flowing into the ocean. The permeable pavement captures pollutants such as motor oil and fertilizer and prevents them from entering our water supply. That helps keep water pollution from impacting the Los Angeles Estuary in Long Beach Harbor, which is important to native birds and marine life. A bus division, which requires a large amount of paved ground, is an ideal space for permeable pavement. By replacing 40,000 square feet of asphalt with permeable pavement and a bio-retention area, we can capture and filter more than 130,000 gallons of water in a single rain event. All of that water is going back into the ground to support local flora and wildlife. The water is also available for our future use. Check out the video below to see permeable pavement in action! Instead of collecting on top of the pavement to eventually run off or flood the area — something that can disrupt safe operations — the water goes right through. If you’re interested in trying to conserve water and save money, now might be a good time to look into trying out permeable pavement on your own property. With the passage of the Measure W parcel tax in 2018, installing permeable pavement on your driveway or patio could allow you to apply for credits to pay reduced taxes. I know we’ve had a lot of rain this winter, and it’s great to hear that California is no longer under drought conditions. But it would be unwise to think this will last forever — and we need to use every method possible to retain and conserve water. If this pilot project is as effective as we hope, we’ll be able to install permeable pavement at more of our facilities and stations, increasing the amount of clean water in our aquifers! Funding for this project has been provided in full or in part through an agreement with the State Water Resources Control Board.